An electronic traveler check prepaid card system and method comprising an electronic traveler's check card which is useable to retrieve money for points of service locations and banks. The system has a database of user information such as a pin number, user's choice for 24 hour rollover start time and passport number which is used to verify the identity of the user before a transaction can take place. The traveler's check card is separate from user's main savings/business or other bank accounts. The traveler's check card can be used for travel/vacations at home or abroad. Traveler's check card can be used at ATMs without exposing user's main bank accounts to fraud. I am looking to license my patent with royalties. Traveler's check card patent has not been sold but has been marketed. Potential markets: business travelers and pleasure travelers. Potential licensors: airlines(wanting to introduce their own travel card), hotel chains(wanting to introduce their own travel card), online/traditional travel companies, banks, credit card and prepaid card industries. Specific conditions: to be negotiated. 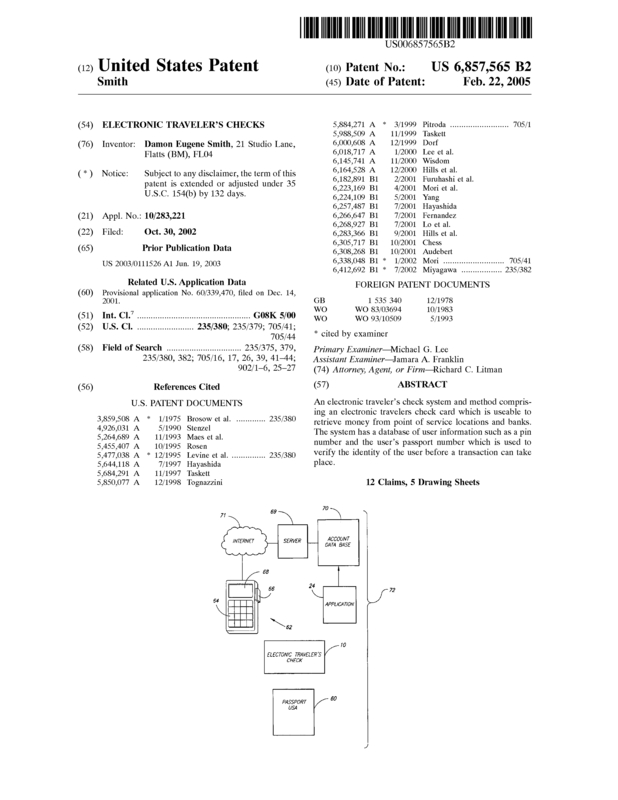 Page created at 2019-04-21 18:41:13, Patent Auction Time.